Soul Jazz Records have again come up with an excellent selection of tracks for this latest compilation. ‘Rocksteady’ is defined broadly here, and overall the collection thoughtfully and successfully captures the moment when the insistent rhythm of rocksteady started to give way to the different emphasis of reggae. The eighteen tracks here may not all be familiar and it is to the label’s credit that this is not just another rehash of well-known tunes. The production on these early cuts is relatively unobtrusive, rightly drawing attention to the music itself rather than studio techniques, and reminding us that Studio One’s reputation was based on knowing when ‘less’ can be better than ‘more’ in the control room. The influence of soul and blues is clear enough at some points, in particular Cecile Campbell’s ‘Whisper to Me’ and Ken Boothe’s ‘Moving Away’. Elsewhere different musical styles make themselves known, for instance in Ken Boothe’s striking ‘Home, Home, Home’ , an unusual excursion into gospel-led reggae with strong and unconventional harmonies, together with lyrics that can easily be read on a number of levels. The Heptones contribute two tracks including the classic ‘Love Won’t Come Easy’ where the prominent rhythm track and latter-era reggae bass start to become more evident as the old rocksteady rhythms changed and developed. The great Alton Ellis, Marcia Griffiths and John Holt can also be found to good effect within the tracklisting here. Standout tracks include the Wailing Souls’ ‘Row Fisherman Row’ (not the Congos’ song) with its repeating reggae rhythm and a great instrumental fadeout which although not exactly dub – it sounds more like someone twiddling the tone control on an old Dansette – hints at where this music would go next. The bass is turned to 11 on the little-known Larry and Alvin’s ‘Throw Me Corn’, again anticipating the future direction of this music. Dennis Brown’s ‘Easy Take it Easy’ with its familiar rhythm track is excellent indeed, here going straight into its instrumental ‘version’ with some early dub flourishes: it would be worth getting this album for this track alone so it can only be a plus that there are seventeen other songs that repay our attention too. Hailing from what they describe as ‘the back streets of London’, Rude Audio offer a fairly unique blend of reggae, dub and drum and bass – with powerful results. ‘Knockemdead’ is the lead single release from their forthcoming 4-track EP ‘Ruder’. The single, featuring strong and effective vocals from Eucalypta LV, manages to combine this South London collective’s many roots and dance-based influences with something pleasantly strange and almost psychedelic in overall mood. You can watch and listen here. The fast-paced retro dub sound of Brighton producer and sound engineer Mike Pelanconi (aka Prince Fatty) has brightened up these pages before (see reggaemusic.org.uk 26th August 2012 and 18th June 2013). 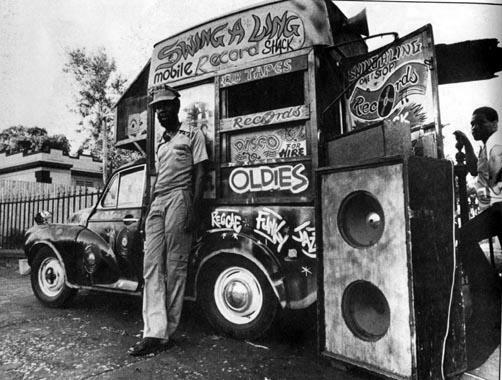 So too have the formidable amplifiers and speakers of Glasgow’s very own Mungo’s Hi-Fi, taking their name from the founder of their city and offering a full-on dub and dancehall reinvention of the classic live sound system (see reggaemusic.org.uk 2nd November 2011 and 5th May 2013). This new release from Mr Bongo Records puts Fatty and Mungo together in a serious sound system competition, each act reinventing five tracks from the other to generate a heavyweight dub-on-dub production. The first five tracks offer Prince Fatty mixes of Mungo’s Hi-Fi, kicking off with ‘Herbalist’ (featuring Top Cat), followed by a languid ‘Scrub a Dub Style’ with no less than Sugar Minott on board, along with nice dub touches to the production. ‘Divorce A L’Italienne’ (featuring Marina P) comes over strongly with some neat chord changes and instrumental breaks atop the essentially ska rhythm. Up next are five Mungo mixes of Prince Fatty tracks, starting with their take on Hollie Cook’s ‘Sugar Water’ which generates a different deep-down electronic feel when compared to the version on her debut album (2011) and on the Fatty-produced ‘Hollie Cook in Dub’ (2012). Mungo also take on Hollie Cook’s ‘For Me You Are’, this time offering a relatively sparse digital reinvention of one of her stronger tracks. Mungo’s mix of ‘Dry Your Tears’ (featuring Winston Francis) offers up a slow and soulful version of the much covered song (try to hear for instance the recording from Bold One and Clint Eastwood from 1978) and in this rendering it could almost be Mungo’s Hi-Fi meet lovers’ rock. In contrast, ‘Horsemove’ (courtesy of Horseman) moves us firmly if implausibly into Wild Western territory. The mix of ‘Say What You’re Saying’ – featuring George Dekker – is darker and deeper than the earlier version on ‘Prince Fatty Versus the Drunken Gambler’ (2012). The Mungo Hi-Fi mixes add typically deep and sometimes doomy electronic sounds in contrast to Prince Fatty’s characteristically brisk and joyful dubs, but it’s not quite that simple: the choice of tracks alongside the differing mixes makes this a happy release indeed. Recorded in Kingston and in Tel Aviv, ‘Prisoner in Love’ is the first single release from Kalbata and Mixmonster’s forthcoming debut album on Freestyle Records. Their stated intention was to record an analogue dub album influenced by the early sound of dancehall and the classic style of producers such as King Tubby. With this in mind, they use a 16-track tape machine and an analogue mixing desk alongside – unusually enough – a group of musicians playing live throughout. After recording the instrumental tracks in Tel Aviv, they travelled to Jamaica and added the sound of selected vocalists and deejays to generate the intended retro sound. So in a sense this stands as homage to the reggae tradition upon which so much has since been built. The measure of success is of course in the sound of the finished product. 80s’ dancehall pioneer Little John provides the powerful vocals for ‘Prisoner of Love’. The backing track provides a sparse and uncluttered rhythm upon which to base vocals that are as reminiscent of the soul songs of the time as they are of reggae. The single also includes a contrasting and more elaborate version of the same song featuring Kutiman, who adds manic keyboard and an upfront reggae rhythm to the basic bass and drum foundations of the song. The ‘Prisoner of Love’ single is released on 17th March, with the debut album – ‘Congo Beat the Drum’ – due on 28th April (vinyl, CD and digital download).